The complex sits just across Hollywood Blvd. from the El Capitan Theatre and offers views of the Hollywood Hills and Hollywood Sign to the north, Santa Monica Mountains to the west and downtown Los Angeles to the east. The centerpiece of the complex is a massive three-story courtyard inspired by the Babylon scene from the D.W. Griffith film Intolerance. The developer of the shopping center built part of the archway and two pillars with elephant sculptures on the capitals, just as seen in the film, to the same full scale. It gives visitors an idea of how large the original set must have been. The center has over 70 shops and 25 restaurants. Major retail tenants that face Hollywood Boulevard include American Eagle Outfitters, Forever 21, and Sephora. The complex also houses a Lucky Strike Lanes bowling alley, a six-plex movie theater, and a nightclub. Hollywood & Highland also houses 65,000 square feet (6,000 m2) of gathering spaces including the Grand Ballroom, used for the Oscars Governors Ball. Celebrity chef Wolfgang Puck operates his regional headquarters out of the complex. The center also includes television broadcast facilities that in 2004 included the studios for the daily talk show On Air With Ryan Seacrest. Currently, the studio is home to Revolt TV. Developed by TrizecHahn and with funds from the Community Redevelopment Agency, Hollywood & Highland opened after three years of construction in November 2001 and is part of an overall effort to revitalize Hollywood Boulevard. The project is an example of joint development, in which a public agency leases the right to develop a parcel in exchange for improvements to the property, in this case, an enhanced portal to the Hollywood/Highland Metro Red Line station. TrizecHahn leased 1.35 acres (5,500 m2) of Los Angeles County Metropolitan Transportation Authority land for 55 years at a rate of $492,000 per year (with additional increases added every five years based on the Consumer Price Index) and four 11-year optional extensions. 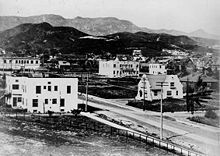 Leading up to the construction of the development the City of Los Angeles was persuaded, through its Community Redevelopment Agency (CRA), to contribute at least $90 million in 1998 toward the initial construction of Hollywood and Highland. This was in addition to the costs of constructing the Red Line subway station below the mall. Trizec Properties Inc. sold its interest in the development for over $200 million in 2004 to CIM Group. This was a substantial loss and represented an investment failure as it was estimated that Trizec spent at least $625 million to develop the center. The current owner, CIM Group (CIM), describes itself as a premier real estate fund manager that makes private equity and/or debt investments in urban communities throughout North America. CIM is headquartered in Hollywood in the TV Guide Building located across the street from Hollywood and Highland. (CIM also owns and manages the TV Guide Building.) CIM has active projects in Los Angeles, West Hollywood, Orange County, Pasadena, Santa Monica, Oakland, Washington D.C., Austin TX, Boulder CO, as well as other communities. One of their better known projects in the Los Angeles region is the Third Street Promenade in Santa Monica. CIM rebranded Hollywood and Highland and repositioned the center with higher end tenants. In 2005, the center underwent renovations to add additional features such as escalators leading visitors from Hollywood Boulevard directly to the third floor of the central courtyard, new signage, and new stores. The Hollywood and Highland complex opened in 2001 with a conditional use permit that enabled, among other things, for the complex to have special exemptions of Los Angeles billboard ordinances. Despite objections of some residents and neighbors, in 2002 this agreement was amended and extended for an additional 20 years. L.A. City Councilman Eric Garcetti, who then represented the Hollywood-area district and was elected mayor in 2013, supported extending this special permit. The design of the center has been criticized. In 2007, Curbed L.A., an online magazine, named Hollywood and Highland the "winner" of their Ugliest Building in Los Angeles contest. In selecting Hollywood & Highland, they cited its aesthetics, pedestrian unfriendliness (including the lack of storefronts on the side facing Highland Ave.), confusing circulation, and "mish-mash of architectural styles". The center played a significant role in attracting development to other parts of Hollywood Boulevard. The TV Guide Hollywood Center (formerly owned by CIM Group) across the street reconstructed the ground floor and has attracted new tenants such as American Apparel, Baja Fresh, Hooters, and Coffee Bean & Tea Leaf. Other notable retail stores that have a presence on the Boulevard include clothier H&M and the Spanish retail chain Zara. In addition, several blocks further east on Vine Street, a W Hotel opened incorporating the existing Hollywood/Vine Metro Red Line station. The sidewalk in front of Hollywood and Highland is considered a coveted location for recent additions to the Hollywood Walk of Fame. As such is one of the few locations where the star memorials are "doubled up" rather than being placed linearly, in order for more stars to be accommodated in front of the center. In February 2005, the Academy Awards statuettes were put on display for public viewing at Hollywood and Highland before the ceremony on March 5. Visitors could have a picture taken outside with a giant prop Oscar that was to be used on the red carpet and in the exhibit could learn about the history of the Academy Awards, see the statuettes that were to be presented, and even get their picture taken holding an actual Oscar statuette. It became extremely popular, so the Academy decided to continue it. The exhibit opened on February 9, 2006 and closed February 24, when the Oscars were removed and paraded down the red carpet into the Dolby Theatre. ^ "About the Center". hollywoodandhighland.com. Retrieved February 28, 2016. ^ "Hollywood & Highland Center Map" (PDF). hollywoodandhighland.com. Retrieved February 28, 2016. ^ Boxall, Bettina (April 11, 1998). "L.A. Plans to Chip In $90 Million for Oscars Theater Complex". Los Angeles Times. Retrieved 2008-12-18. ^ Diamond, Jonathan (December 20, 2004). "Year in review: Disney, for one, is happy to see 2004 end, but real estate brokers wish time..." Los Angeles Business Journal. Retrieved 2008-12-18. ^ Vincent, Roger (February 28, 2004). "Trizec Completes Sale of Multiuse Complex". Los Angeles Times. Retrieved 2008-12-18. ^ McGreevy, Patrick (September 21, 2002). "City Extends Hollywood-Highland Pact". Los Angeles Times. Retrieved 2008-12-18. ^ jwilliams (April 17, 2007). "Here It Is... Your Ugliest Building Winner". Curbed LA. Retrieved 2008-12-18. ^ "Shopper's Guide To Hollywood & Highland". KCBS-TV. January 18, 2016.